When EarthBound was released, everyone thought that the ultra-rare Gutsy Bat weapon could only be obtained by defeating a Kraken enemy in the Sea of Eden. Given that there are like only three of them in there and they’re permanently gone after you defeat them, many kids were frustrated when trying to win the bat. The thing is, though, that the Gutsy Bat ISN’T dropped by Krakens. They’re dropped by Bionic Krakens in the last dungeon of the game! So how did this myth come about? Why, the player’s guide that came with the game, of course! Some players SWEAR that they’ve gotten the bat from normal Krakens, even though it’s been proven not possible. So is this a case of faulty memory, lies turning into false memories, or is there really a rare version of the game out there that lets you get Gutsy Bats from Krakens that none of us know about? How did they get that screenshot for the guide? If the normal Kraken dropped the Gutsy Bat at some point, why did they change it to the Bionic Kraken at the last second? Especially when it’s the Bionic Kraken that drops the bat in the original Japanese version? Very strange stuff. Anyone have any ideas? I think the Kraken & Gutsy Bat myth spread in other ways too back in the day, but I don’t recall where. Does anyone remember? Considering the low drop rate, it might’ve just been quicker and easier to doctor up a screenshot, or use development tools to get the item, as opposed to having someone fighting krakens forever trying to get it to drop naturally. Why would they do that? Just to lie to people? Most likely they were incorrect with what Krakens dropped the bat and they just debugged the item into their inventory to “show” that they got it. I doubt the Player’s Guide makers went through grinding for the bat, we all know how long it takes. hahaha omg i spent so many hours restarting without saving to try and get it from the sea of eden. screw you players guide. I’m just glad they weren’t wrong about the Sword of Kings. By the time I got that, there was no way I was going to grind to get the Gutsy Bat. Maybe the writers and/or graphic designers responsible had a lot of late nights. I don’t know anything about the particulars but the I will NEVER forget the feeling of indignation when I discovered that after years of constantly telling myself, “THIS PLAY, I will not give up.” only to be showered in shame when I inevitably finished Magicant disheveled, irritable, and never wanting to walk through Magicant again. I do remember thinking it was suspicious about only have three shots at this. However, it was nice to finally discover the truth whenever it was I realized the book wasn’t as trustworthy as I had once believed. I now enjoy Magicant much more and it is nice to finish those epic 1/128 runs with the final piece of the puzzle. There are several mistakes/errors/misprints in that book, but I still love it. Maybe it is the Bubble Monkey Scratch’n’Sniff…. yeah that’s probably why. Is there a page or article somewhere that lists all the incorrect tips and info in the EB Player’s guide? One that also points out obvious instances where they used a screenshot from MOTHER 2 instead of EB. Starmen.net has a page of the spelling/grammer errors and remnants of Mother 2 in the official game guide if you want to check it out. It doesn’t describe the incorrect tips though. Heh, I had started that page but never really got into it. I can’t believe this. I’ve owned EarthBound since the first few weeks of it’s release. I still have it (and play it) to this day. I have never ever, EVER had a Gutsy Bat drop for me in my many playthroughs. Mind. Blown. To add to my last post: I also can’t fathom how I misses this particular tidbit of information over the years. I’ve been around the community (mostly lurking) for YEARS now (from the days of “M2EB… and back again” and before starmen.net was formed). Has this been widely publizised before and I’ve just had an enormous blind spot towards it? It DOES drop from the Kraken in the Sea of Eden. My friend and I spent quite a while farming them, and I’m sure the drop rate is very low. We’d take shifts racing past the trash to the Sea, only for three stinking Kraken, lol. I’m not exactly sure what you are trying to say Warmgun but people have opened the ROM and viewed innards of this game. If Mato says its been proven that impossible from Sea of Eden, then dag nabbit it has been proven impossible. I can also confirm 100% that you get the Gutsy Bat from a Bionic Kraken in the Cave of the Past. I can confirm this from at least 5+ different plays. Actually, Warmgun, if that’s true, and you did it on a cartage, and you still have the cart, you should find someone to dump the ROM for you. You could have a rare beta copy! People have long speculated that the Player’s guide was being developed while the US version of Mother 2 was being developed into English, but what if the Player’s guide and the English version of Mother 2 (i.e. EB) were being made simultaneously with Mother 2 itself? Maybe only slightly behind? 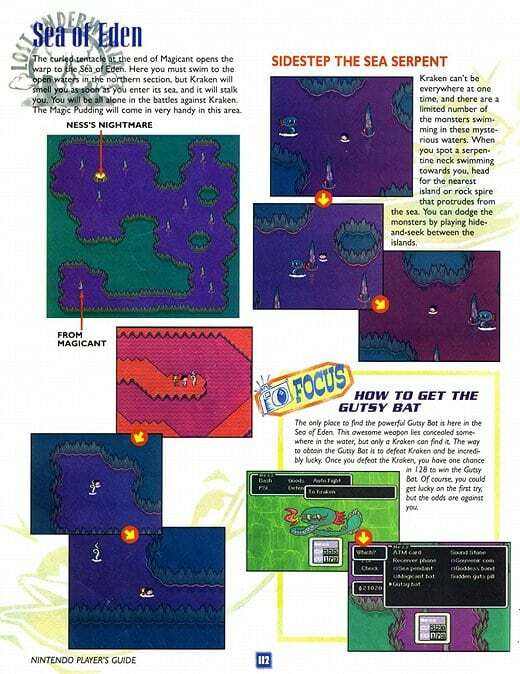 Maybe there was a time when the Gutsy Bat was planned to be available in the Sea of Eden in Mother 2, and the English version and the player’s guide were being made to reflect that. Once it changed, so did EB and the guide. Just a theory. My guess is that the guide was made with some sort of hybrid-game between Mother 2 and an English-translated EB. The fact that the sign in Threed says “Threek” on the Map provied for Threed is a small hint of that. It may have been an early version trying to make this game slightly easier or something. In my run to Gigyas, I didn’t encounter any monsters, much less the Bionic Kraken, in his den. Is there a link to a page that shows how it’s been proven that Krakens don’t drop it? When we say the game’s been ripped open, we mean wide open. If your copy of the game happens to have you getting the Gutsy Bat from a Kraken in Magicant, I, and I’m sure many other people, would be interested in seeing a video of this event. 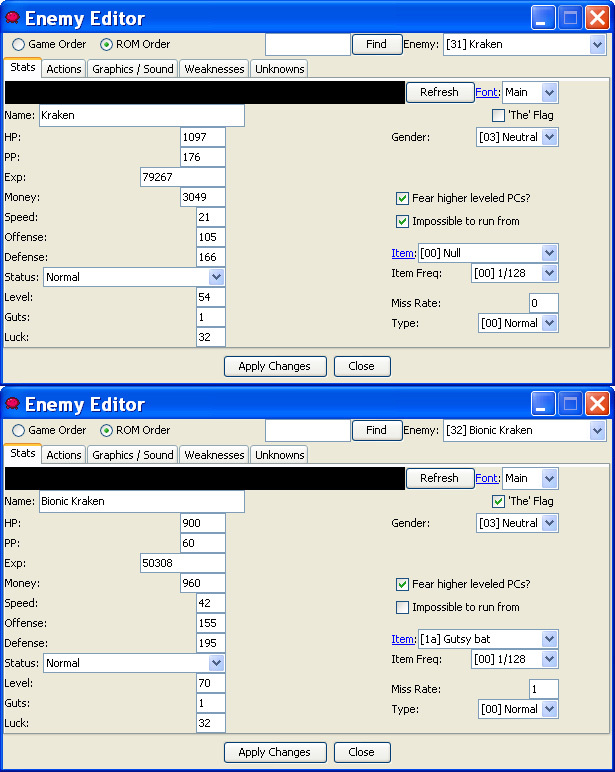 Warmgun: Here’s what you’d see if you used PK Hack to look at the enemies’ stats on an unmodified rom. i spent 3 minutes trying to get that bat. Weren’t there a limited amount of kraken in the Sea of Eden? I’ve never got a Gutsy Bat or Sword of Kings, and I’ve never bothered with trying. I DEFINITELY got the Gutsy Bat from a normal Kraken on my first try. I clearly remember reading this part of the guide and swelling with pride that I was extremely lucky. Probably C, but as I said to Warmgun, see if you can find a way to dump the ROM, you might have a beta cart because a regular cart has been PROVEN to not let you get the bat from the normal Kraken. I’ve gotten the gutsy bat in there before. If anyone merely took an editor to the game rom, youd know THEY DO drop from those 3 and theres mods to change it from 1/128 to 1/1 etc. I’m confirming they do beyond that too even on the 3-4 carts ive played on. Enemies 48 and 181 are Krakens, they don’t drop any items as you can see.